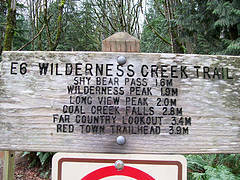 E6: Wilderness Creek Trail - Trail begins at the Wilderness Creek trailhead on State Route 900, about a mile from May Valley Road. With many switchbacks it ascends the creek to Boulders Junction, does a hairpin turn and mounts a ridge on the right bank. A view back down to the tiny people on the bridge below surprises hikers with how high they've come. 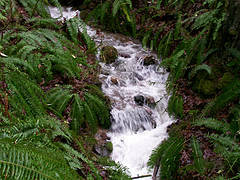 The trail passes Cougar Mountain Cave formed by talus fallen from the clifftops high above and reaches Shy Bear Pass. 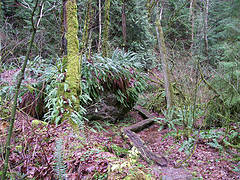 All the trails are well-signed and maintained and there are brochures at the trailhead describing the trails and the history of Cougar Mountain. 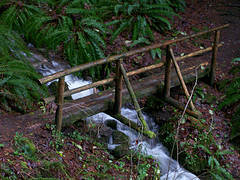 The bridges are intact, with handrails where needed, and boardwalks lead across swamps. Getting there Take Exit 15 (Renton) on Interstate 90, turn right, drive to the Newport Way stoplight and then 2.8 miles beyond to the trailhead parking on the right. There is room for about 15 cars.